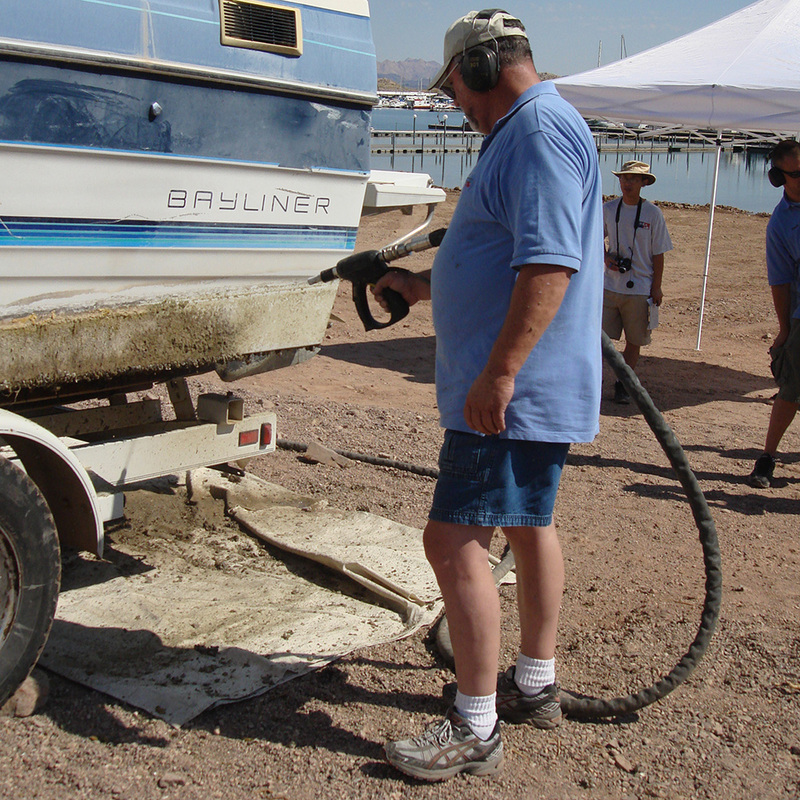 A person demonstrating a way to clean a boat after being in infected waters.WASHINGTON – Bureau of Reclamation Commissioner Brenda Burman announced the award of a $185,000 grant to the Colorado Parks and Wildlife for enhancement and further roll-out of a watercraft inspection and decontamination database. Federal and state inspectors use the database to track watercraft decontamination activities occurring at lakes, reservoirs and related waterways. These watercraft inspection and decontamination activities are being conducted to help prevent the spread of quagga and zebra mussels and other aquatic invasive species. "Preventing the spread of aquatic invasive species like quagga and zebra mussels is a high priority for Reclamation," said Commissioner Brenda Burman. “This grant will make it easier for federal and state inspectors to track decontamination activities and is another step towards consistent effective prevention." Colorado Parks and Wildlife initially developed the database in 2014 to monitor boat inspections occurring in the state of Colorado. The database was expanded in 2016 to include multi-jurisdictional uses through a grant with the U.S. Fish and Wildlife Service. The database is maintained through an existing contract between Reclamation and Colorado Parks and Wildlife. In addition to invasive mussels, it helps track other aquatic species such as Asiatic clams, water hyacinth, water lettuce and giant salvinia. Since initial development, the states of Arizona, Montana, Nevada, New Mexico, Utah and Wyoming are currently using the data sharing system statewide. The system is also currently being used in Texas at Amistad National Park. In California, there are three water districts using the system, including at Lake Tahoe. The database use continues to increase each year with the states of Nebraska and South Dakota having expressed interest in using the system beginning in early 2019. The database is comprised of a mobile application that works on any iOS or Android device, a database and a website application. Reclamation’s grant will provide for increased help desk services, administration/reporting, and technical support for all participants using the system. Entities using the system must provide their own hardware (computers, tablets, phones) and must pay for their internet connectivity. The system is password protected and does not store any personal identifiable information. The grant to the Colorado Parks and Wildlife is part of the $4.4 million in funding announced earlier this year to combat quagga and zebra mussels in the West. Learn more about how Reclamation is addressing invasive mussels at www.usbr.gov/mussels.